I'm now the proud owner of a fabulous 38b Jeffries, and just wanted to say that my experience buying it through Greg Jowaisas was outstanding. 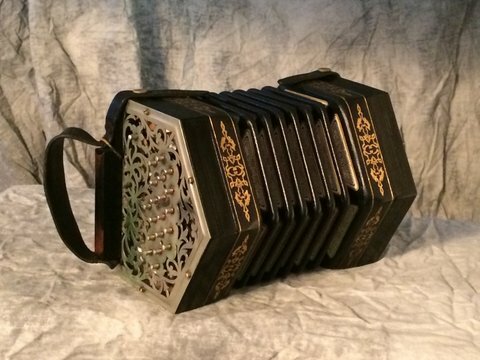 It was a significant purchase and Greg spent a lot of time answering my questions, following up phone calls, checking and tuning the instrument, and just generally being patient with someone new to the Jeffries and high-level concertina world. And here are some photos of the instrument. Has a nice sweet, but loud tone. As my mother would have said, "Great honk!" I feel like I'm at the beginning of a long journey to see what this instrument can do. Some interesting facts: it's an original C/G Jeffries sr instrument, has Dipper bellows, and is tuned in 1/5 comma meantone tuning (the chords ring). Thanks, maki. 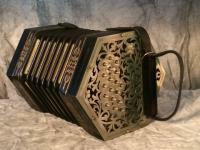 Yes, I won't be taking this one to the beach. . . .
Beautiful instrument. And you can't go wrong with Greg. Last September he was selling a 30 button Jeffries C/G I would have killed for. And my wife would have killed me. 30b still available, Jim. Perhaps your wife would only punish you a few years instead of contemplate murder. worth the purgatory? You may get time off your sentence for good behaviour and good concertina playing! lol! 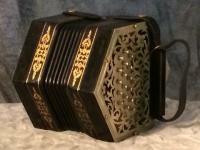 I have sent many of my concertinas to Greg and they all came back in excellent playing condition. Man, what a gem! 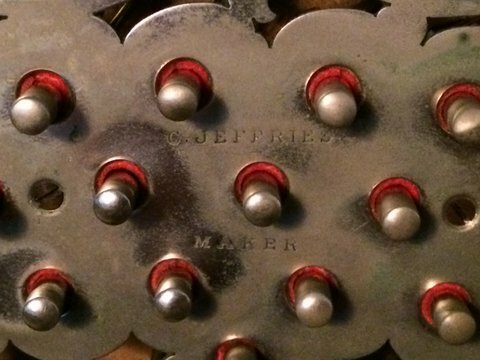 And the Jeffries is awesome too! Greg was kind enough to guide me on a restoration project. Thank you Greg. I've got a G/D much like that, 38 buttons with Dipper bellows. A magic combination in my opinion, you can't go wrong with it.